Inclusions: Top of the line stainless steel appliances including Wolf Range, Industrial range hood, quiet built-in dishwasher, 2 glass fronted bar fridges. Washer, dryer, electric light fixtures, window coverings, satellite dish. Mechanical Upgrades: Updated wiring, kitchen fall '04, main floor powder rm & closet added '04, refinished hardwood floors on main floor '04, new full alarm system (owned), updated CAC, GB&E, thermo windows. Exclude: Gas hot water tank rental & built in Stereo speakers. Fabulous four-bedroom detached Victorian home is a sunfilled oasis in the city! 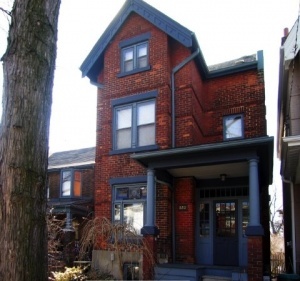 Ideal location on Macdonell, one of the prettiest streets in the neighbourhood. With stunning renovations and an exceptional treed garden, this lovely home is perfect for the urban family. The vibrant neighbourhood of Roncesvalles Village is an amazing mix of old world and gentrification. Family-friendly and blessed with excellent transportation routes and a varied commercial shopping district, this area also boasts ample parkland and recreational opportunities, all within walking distance. At the heart of this neighbourhood is Roncesvalles Avenue, with its incredibly interesting mix of funky restaurants and gourmet stores rubbing elbows with ethnic delicatessens and family businesses. Children and adults alike enjoy many recreational opportunities including easy access to community centres, ice rinks, Grenadier Pond, and parks including the 399-acre High Park with its abundance of fun family activities. Getting around is easy with so much public transit: The Queen, King, College and Dundas streetcars all connect to subway stations on the Yonge line, while the 47A, B & C Lansdowne buses connect to the Bloor line at Lansdowne subway. A beautiful front yard landscaped with perennials and a weeping mulberry tree leads to the entrance of this lovely Victorian and the large foyer, with new dark cherry stained hardwood floors running through the main floor. The formal dining room is spacious with a working fireplace. An abundance of natural light is admitted via a large picture window with beautiful stained glass. The fabulous open concept custom chef's kitchen was fully remodelled last fall and features a centre island with a below counter sink, and halogen lighting. It is absolutely stunning, with granite countertops and top of the line stainless steel appliances (including a Wolf double oven w/6 gas burners, an industrial range hood & super quiet dishwasher, and 2 glass front bar fridges!). It opens to the large living area for easy entertaining. The mudroom/pantry was part of the kitchen reno in 2004. It is insulated with heated slate floors, more kitchen storage, granite counters & a gorgeous double French door walkout. There is a new funky main floor powder room and closet. The second level features three bedrooms, cedar-lined closets. The third bedroom is ideal as a nursery or office. The modern main bath is spacious with a separate shower stall and is semi-ensuite to one of the bedrooms.The third level has a huge master suite with a closet and a walk-out to the large flat roof - great deck potential! It is currently being used as a family room. The basement is spacious, with a workbench area, a laundry area, plenty of storage, cedar closet. There is reasonable ceiling height an exterior walkout, plus a three piece bath. The spectacular rear garden is private, fully fenced and features a deck, a vegetable garden, dozens of varieties of shrubs, berries, perennials and flowering trees. A stone path runs from the rear deck to the driveway. The home is at the end of a short lane and is very private, true country in the city ambiance.